Back in 2014 I posted Ticking Stripe Fabric Reviews. At that time I tested a variety of ticking stripes all of which turned out to be too light weight, too limp or too narrow for slipcovers. My search continues for the classic, old school stuff — a cotton woven ticking (not printed) in a heavy weight twill or herringbone weave without fire retardant. In the meantime, I leave you with a little ticking inspiration. For this simple tie-back slipcover, I used my stash of vintage ticks from the 1960’s — tightly woven, weighty and durable. This entry was posted in armchair slipcovers, slipcover fabrics and tagged ticking slipcover on June 18, 2017 by slipcovermaker. Absolutely LOVE Ticking!! Years ago, when I was buying/selling antiques, I would come across that old ticking at yard sales, estate sales when we lived in Nevada City, California, but not for a very long time now. I know exactly what you are talking about, that was why everything way back in history, was made out of it-laundry baskets, table cloths, bedding, iron board covers, pillow cases, the old mattress covers. The last vintage ticking item that just wore out on me was a darling old clothspin holder that I had on my outside clothsline. I thought I read the English are re-producing the old ticking. The chair you did in Ticking is beautiful! You’re right Paula, the vintage heavy weight ticking isn’t as easy to find here in the U.S. as it once was. The English are producing lovely ticking but even that is getting lighter in weight and it cost a fortune to have yardage shipped from there to here. The hunt continues. 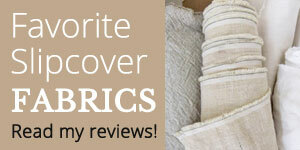 Thanks for taking a look at my ticking slipcover!